Does your pet have arthritis, chronic pain or a wound that is not healing? If you answered yes, then laser therapy may be just what the doctor ordered! 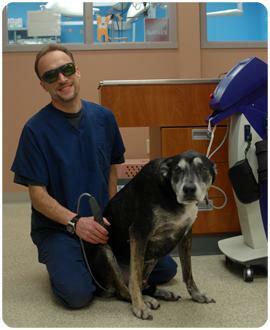 Laser therapy is a non-surgical procedure that does not require the use of drugs. It works by producing wavelengths of light energy that enter damaged cells and stimulate an increase in blood flow, thereby speeding up the healing process and essentially helping the body to help itself. Laser therapy can help reduce pain and inflammation in a fraction of the time and with no side effects or risks. Most pets begin to feel better in less than 12 to 24 hours! Simply ask anyone on our staff if you are interested in trying it out for your pet! The first treatment is on us. Yes, it's free!